Happen to be in the city for an amazing show at the Metro and we needed to eat soon and at something nearby. 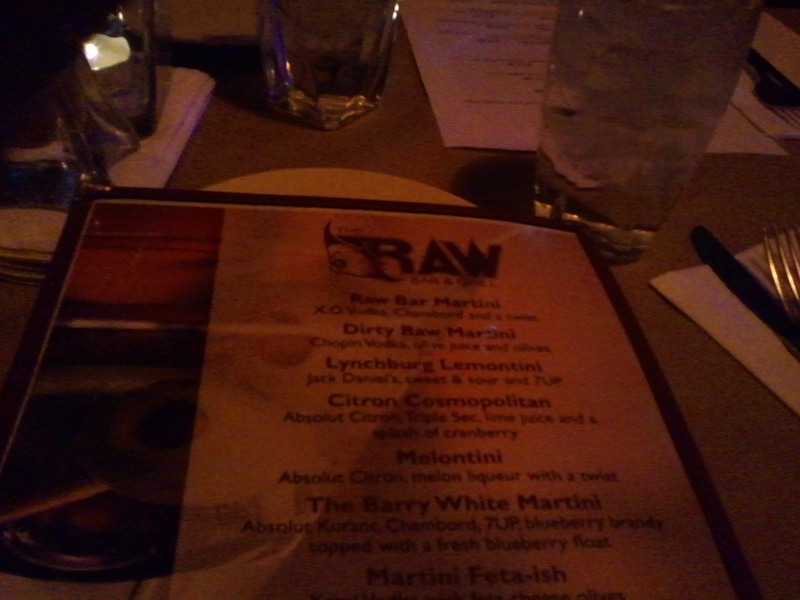 On nothing but random chance did we decide to eat at a place called Raw Bar. We had a lot of options to choose from for places to eat at along Clark Street. Not sure how we ended up here. It wasn’t a particularly flashy store front or anything. As soon as you walk into Raw Bar the first thing you notice would notice is the volume of the music. It’s a few notches above background sound. The bar itself lines the right side wall while the left side has some tables and then a door in the rear leads to the dining room. We weren’t seated in the dining room. They set us at the dining tables near the bar. This area should have had only high tops and bar seating. From a comfort level I have to say these tables are cramped for the party of four that we had. They’re made even more so by the shelf built into the wall that reaches out far enough to touch the shoulder of whomever is dining in that seat. My friend across from me said that there were obstructions underneath the table coming from the wall that got in the way of his legs. The waiter we had, Nixon, was an absolute joy as far as servers go and he was one of the best parts about Raw Bar. The service was one of the high points at this restaurant. Nixon had excellent suggestions to make, knew the answers to menu questions and touched with our table several times. He also fit with the theme of the restaurant, which I’ll touch on in a moment, wearing his fisherman’s sweater and wool cap. We put in our appetizer orders and received our drinks. While waiting I had the opportunity to look around the restaurant area we were seated at and take it all in. Like most bars and eateries in this area it was dark. The general theme was a pier like setting. It was definitely meant to in evoke the sense of being water side somewhere. I say this because of the “junk on the walls” décor. There had oars, they rope, they had fishing and boating supplies. That’s what was on the shelf that was butting into my table space. But a few things struck me as bad atmosphere. First, the lobster tank. It sits right next to the entrance of the restaurant. It’s a small cube like container undecorated and on a pedestal. I don’t mind the appearance of it, what I mind is that it was empty. It clashes with the idea that you specialize in fresh sea food because the tank containing it is empty. If they didn’t have the tank out for viewing in the first place it wouldn’t strike me as a missing element. Something like that needs to be seen in working order at all times or not seen at all. The bar itself is also not the best set up. First, from a functional standpoint I witnessed the wait staff having to duck under a fixed ledge on the side closest to the door. That should be closed off or that should be an opening. Waiters can’t serve drinks while dodging under wooden barricades. Also, the bar itself is dark. Darker than the dining area in fact. There’s no lighting on the premium liquors either. The profit for any bar is in that product. And finally, a great deal of the countertop is taken up by boxes filled with ice that have oysters sitting in it. That takes up a lot of retail at the counter and if not kept immaculately clean that can be a real eye sore for the patrons. I didn’t sit near enough to the bar to see the oyster displays but it’s a risk for décor. As far as the food is concerned it was solid. For starters we ordered an alligator tapas and a plate of Edamame. The Edamame tasted exactly like it always does. Edamame. No issues but nothing capable of wowing no matter where you get it. It’s simple. The alligator dish was interesting. I don’t mean it in a bad way but the first thought I and my friend had when we took our first bite was “this tastes like a chef Boyardee sauce.” The texture was there with its granules of meat and vegetable. It was a thick tomato based sauce with a smoked flavor to it. It’s not an insult, that’s just what it brought to mind for both of us. The alligator was cooked well. Very tender, fresh, good flavor. The downside was that this dish, even for a tapas, was very small. And for the eight dollars they charged four pieces of meat is slightly spares. The presentation was a bit boring as well. It was just a plate with sauce and beneath the sauce was alligator and some chopped tomatoes. For mains there was an Avacado burger ordered, a pepperoni pizza on what they claimed was flat bread (I don’t think it was) and then I and a friend ordered two chicken dishes that both sounded really unique and split them. I know, no fish at a place that claims to be a fish restaurant. But the menu has some really interesting chicken choices that needed to be tried. Nixon spoke highly of them too. I ordered what they called Jumbo Charcoal Chicken. This is a marinaded chicken dish cut into large briquette shapes and cooked over a grill and served with a heavy smoky sauce over them. 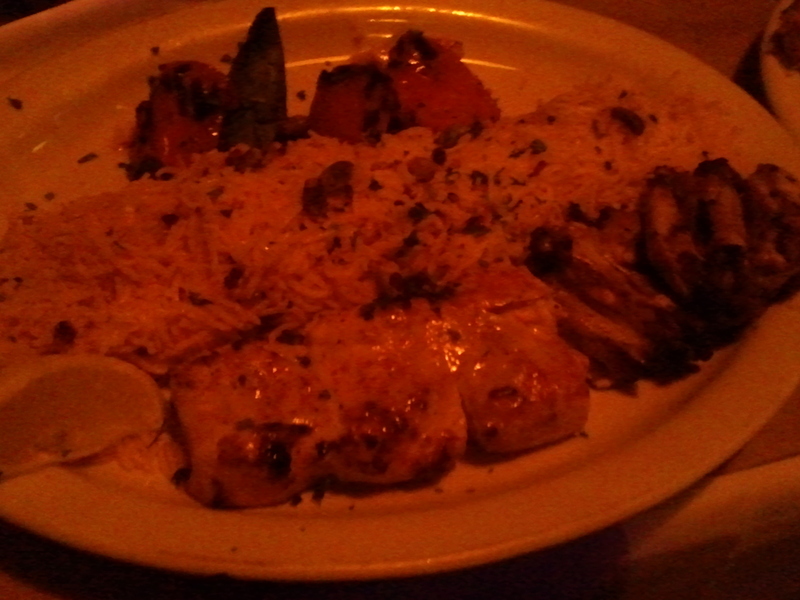 It’s accompanied by an excellent long grain saffron rice dish that’s done with pistachio, pomegranate and cranberries. 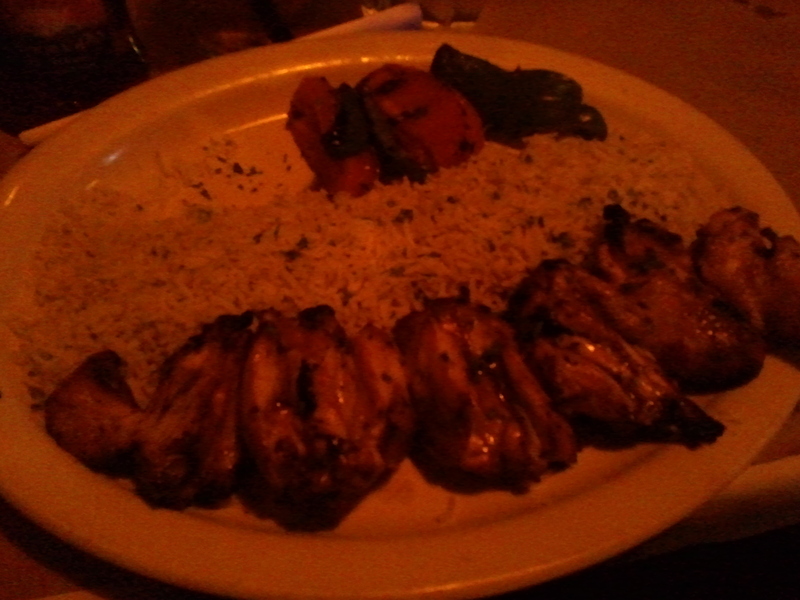 The rice paired really well with the smokiness of the chicken. The chicken itself was drier then I’d of liked but only slightly and the marinade had a very strong lemon/acid taste that was to me overdone. Overall it was a decent dish for fifteen dollars. My friend went with Joujeh, which is an Egyptian dish that immediately reminded us of some of the Middle Eastern dishes we had a restaurant called The Ather in Elmhurst. Joujeh(Joojeh) is a super simple dish. Basically this is chicken seasoned with all the Middle Eastern essentials like Turmeric and Saffron and then cooked on a skewer over an open flame. Easy. And this dish was done really well. The chicken was cooked perfectly, very moist and very tender with just the right amount of blackening. The let down was his rice. The Dill rice was very weak in flavor. So we had opposite experiences with our dishes. I got the better side with the weaker chicken and he got the weaker side dish with better chicken. In all, Raw Bar was solid. I don’t feel over charged for anything; it delivered a good overall experience. Not bad. At the same time, I wasn’t wowed either. Would I repeat? Not really. Not because it gave me a bad experience but because it did nothing to tempt me back. Everything I had was a reminder of somewhere that does it better. Their menu was a bit scattered between Middle Eastern choices, contemporary American, Pub fair and Tapas so it made the theme inconsistent. That combined with the cramped uncomfortable dining space makes this place worth a visit but only if you’re nearby and have nowhere else in mind. Don’t make it your target destination. Blargh to the dry chicken. Should have come to Rockit with us. Truffle fries and Kobe beef burger for the win..
You and my brother need to hit up the city more! Yes sir, agreed on more Chicago visits.